Our charity concert has raised the roof to the tune of a £10,000 profit. 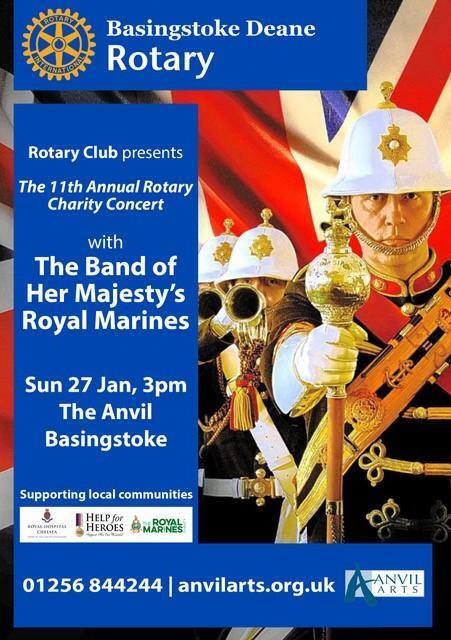 The 11th annual Basingstoke Deane Rotary Club concert was held at The Anvil on Sunday featuring a performance by The Band of Her Majesty’s Royal Marines Collingwood. The band played an array of songs from military tunes and jazz numbers to Ravel’s Bolero and pieces of music from Star Trek and E.T, performed under the direction of Captain Tom Crane and Warrant Officer Tim Carter. The guests of honour were the Chelsea Pensioners who had a standing ovation as they marched across the stage. The concert raised a profit in the region of £10,000 which will be split between The Royal Marines Charity, Help for Heroes, The Chelsea Pensioners and a variety of local Rotary charities. The Chelsea Pensioners helped with a bucket collection at the door raising, nearly £900. The club would like the thank the people of Basingstoke for their generosity and their on going support. We hope to see you all next year."